True Application Performance Monitoring (APM) cross-cuts many IT tiers: network infrastructure, physical and virtual infrastructure, databases, mobile devices, etc. An ideal Application Performance Monitoring solution provides visibility over any infrastructure, for any app and any audience. Enterprises are transitioning to cloud, hybrid WAN and BYOD. 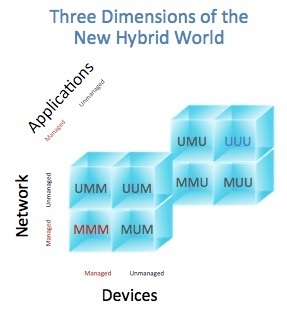 We call this the three dimensions of the new hybrid world. Traditional Enterprise Architecture is in the bottom left front quadrant. Managed applications are typically hosted in the Private Cloud. Many enterprises have managed networks and managed devices such as laptops, desktop, IP phones, etc. Cloud computing, mobility and BYOD trends are rapidly changing the landscape, driving Enterprise Architecture to the top right quadrant. Enterprises are now consuming SaaS applications that are not managed by traditional IT. The Internet has become a much more stable platform; businesses are migrating their traditional network to the Internet. Users are accessing Enterprise content from anywhere across the unmanaged Internet. Enterprises are also dealing with an influx of unmanaged BYOD devices. Implications: In this new hybrid world, you will likely have limited visibility of devices, applications and/or networks. Multiple administrative domains will become the new norm. Enterprises need new capabilities to perform fault isolation that span different organizations, groups and service providers. This means a lot of room for finger pointing. We believe modern APM solutions need to address this added complexity with the ability to provide visibility across any public/private network, any public/private cloud for any device. There is much focus on web performance management in regards to APM solutions today. Voice and video are more challenging data types when it comes to performance and quality of experience. Yet, we do not see as much emphasis from the APM solutions today. Voice and video remain as their own silos from a performance management perspective. Perhaps when WebRTC becomes mainstream, we would see voice and video become a focus of APM solutions. 3. Any Personae – Tools should be capable of collaborative troubleshooting and leveraged by sysadmin, DevOps, network engineers, app developers, etc. According to a study conducted by EMA, 81% of respondents indicated that cross-domain triage teams were being invoked to tackle application performance issues. The teams combine network, application, database, server, endpoints, etc. Even more interestingly, 66% of respondents indicated that network operators were taking the lead most or all of the time. This can only be interpreted as a need to arm network operators with the tool to succeed in their lead roles. The network is the resource that binds the user and the application together. It seems natural that network operators take the lead role in these challenging cross-domain initiatives. Despite the pressing need, enterprises are still challenged by the lack of tools that can present a unified picture to meet the needs of these different audiences. There are no shortages of silo tools, but they lack abilities to correlate different data sources to present the unified view. Despite the diversity of APM tools, there is still opportunity for a tool that can be leveraged by different cross-domain teams, different application types and across the hybrid cloud/network world. Ulrica de Fort-Menares is VP Product Strategy at LiveAction.